Hilton Bandung proudly announces the “Dine 'n’ Fly” promotion for the second year that will be held from September 1 to December 21, 2014. The promotion offers guests the chance to win exciting prizes while enjoying great food and beverage deals at Hilton Bandung. By simply spending a minimum of IDR 1,000,000 at any of Hilton Bandung's food & beverages outlets: Purnawarman, Fresco, Magma Lounge, Caffe Cino, and in-room dining and guests will automatically receive an electronic Gift Voucher (eGV) from AirAsia starting from IDR100.000 to their destination of choice. What's more, one winner guest will have the chance to fly off on an unforgettable 10 days holiday for two persons and stay in Hilton’s hotel in DoubleTree by Hilton – Kuala Lumpur, Malaysia, Hilton Hanoi Opera – Hanoi, Vietnam, Hilton Sukhumvit – Bangkok, Thailand, Hilton Singapore – Singapore and Hilton Bandung – Indonesia. "Hilton Bandung's restaurants have been popular in the city with their own unique specialties and by offering value-added privileges to guests through promotions such as this we hope to add to the distinctive dining options available here," said Scott Wilson, General Manager of Hilton Bandung. At Hilton Bandung, our intention is to provide dining experiences and a philosophy of eating right. We are what we eat … and in that case, it makes sense to Dine Well. Dine Well is our Culinary Philosophy - an effort to go beyond the day of your visit, based on what is important to our guests, to care for our local communities, for the environment and to live well. The five core elements of Dine Well: Sustainability, Nutritious, Fresh, Clean and Green. We believe this is part of our responsibility towards a better world, for our guests, our communities and our environment, a world which we embrace at Hilton Worldwide through our wider Travel with Purpose initiative. Experience fresh flavors from Asia and around the world in the all-day dining venue, Purnawarman Restaurant at the Hilton Bandung. 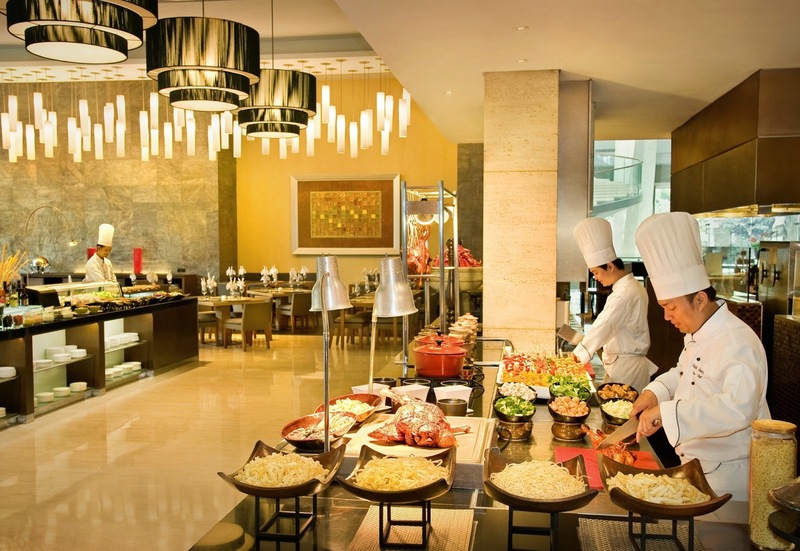 Savor a daily fresh buffet breakfast, a la carte lunch and buffet dinner and experience the theatrical, interactive kitchen. Dine on contemporary and traditional Asian delicacies such as Pindang Iga, Sop Buntut and Purnawarman Fried Rice on relaxed indoor and outdoor seating in this warm and welcoming restaurant. Already best known for its freshly made Pasta and Pizza, our renowned Fresco outdoor poolside Restaurant launches a new and larger dinner menu. Featuring seductive prime meat cuts including our signature Striploin Steak, a range of new seafood dishes and other “must try” include Homemade Pappardelle.